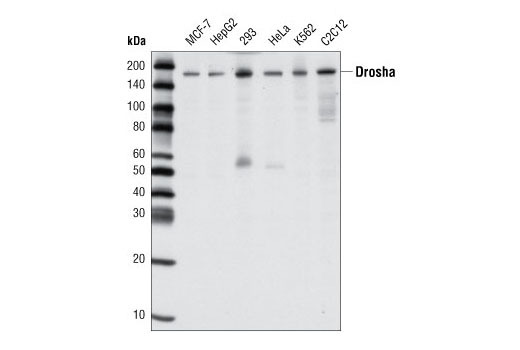 Western blot analysis of extracts from various cell types using Drosha (D30F3) Rabbit mAb. Chromatin immunoprecipitations were performed with cross-linked chromatin from mES cells and either Drosha (D30F3) Rabbit mAb or Normal Rabbit IgG #2729 using SimpleChIP® Plus Enzymatic Chromatin IP Kit (Magnetic Beads) #9005. The enriched DNA was quantified by real-time PCR using SimpleChIP® Mouse Sox2 Exon1 Primers #30180, mouse Nlrp12 exon10 primers, and SimpleChIP® Mouse MYT-1 Promoter Primers #8985. The amount of immunoprecipitated DNA in each sample is represented as signal relative to the total amount of input chromatin, which is equivalent to one. 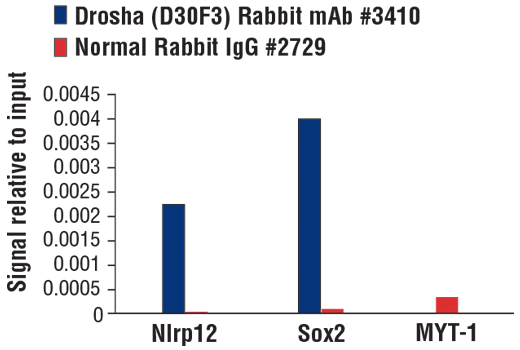 Drosha (D30F3) Rabbit mAb detects endogenous levels of total Drosha protein. Monoclonal antibody is produced by immunizing animals with a synthetic peptide corresponding to residues surrounding His549 of human Drosha. Drosha was identified as a nuclear RNase III that catalyzes the initial step of microRNA (miRNA) processing (1). This enzyme processes the long primary transcript pri-miRNAs into stem-looped pre-miRNAs. Interference of Drosha results in the increase of pri-miRNAs and the decrease of pre-miRNAs (1). Drosha exists in a multiprotein complex called Microprocessor along with other components such as DGCR8 (2). Drosha, along with DGCR8, is necessary for miRNA biogenesis (3).